but mostly they are just modular walled, and well, a little boring. 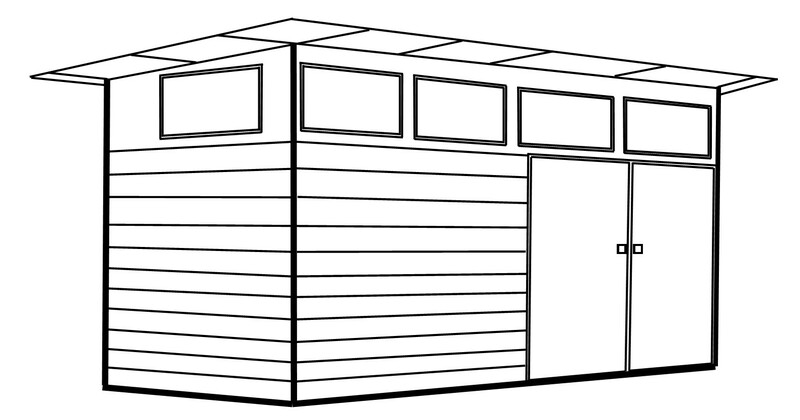 I have been pondering the idea of a kit shed for a while and thought I would just build one from scratch to see how long it would take and how difficult it is to accomplish. Obviously, post and beam kits would have precut, checked out, and drilled posts, as well as beams, rails, flooring and roofing. Without a kit, I will have to do all the planning, wood selection, foundations, carpentry, roofing and cladding myself. As I need a shed size and height to fit into specific space I wasn't able to find a pre-made tin shed that suited. Most tin sheds have low ceilings and I required a 3.6 x 2.4 x (up to)3m ht shed. The height I need is for space to stash spare wood and gear around the ceiling and to have high windows for light, something missing in most sheds, and as I live in the Queensland tropics, I need insulation. A quick look on the net tells me a wooden shed kit of this size supplied is about $7000AUD. My budget is $3000, and I believe I can do it easily. Of course my labour is not costed, but that's the same as a kit. 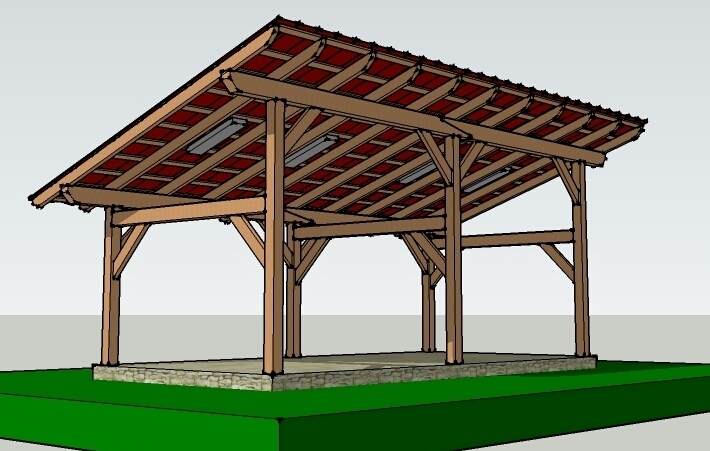 Wooden sheds are prolific on the net and most are pretty ordinary, but I came across this graphic of a post and beam shelter and I liked the simplicity of its design. It sits on 6 posts and has a skillion roof. I will need to add a few more uprights to support the cladding though. I thought about a concrete floor but access for a concrete truck is terrible to this site so I will opt for a raised floor system. I will also add plenty of roof overhang, like the graphic suggests, on all four sides to add shade to the walls. I'm not quite sure about cladding or flooring yet so I will build it to accept a couple of different options. This is what I think it will look like in the end, but it could change a bit as I go depending on materials etc. My property is full of termites: not in the house as it is made of cypress pine and block, but around the 1 acre they are generally everywhere. So all materials must be termite resistant. I have a $3k limit to this project so CCA treated pine seems to be a sensible option. Pest resistant flooring is a worry as it is very expensive so I will ponder that some more. The bearers will be sleepers to get it up off the ground. They are H4 treated so can touch the ground (or be in it) depending on your site. I read on the net I can apply wood preservative/termite treatment such as Hovex Protecion Termite Defender to, for instance, 3 ply and use that as flooring. I would like a flat floor if possible so planking wouldn't work. Tongue and groove treated particle board is only available in 4.2 metre (14ft) lengths which requires 2 people to move around. There is plenty of good looking cladding available that is pest resistant: profiled fibre cement and treated pine weather-boards for instance. So I have the makings of a project plan to build my man cave. The next step will be drawing up the shed plans for this post and beam building. For the next posts in this Post and Beam Wooden Shed series, choose an arrow..you are presently on page 1.